Thank you for the compliment, DSiemens. 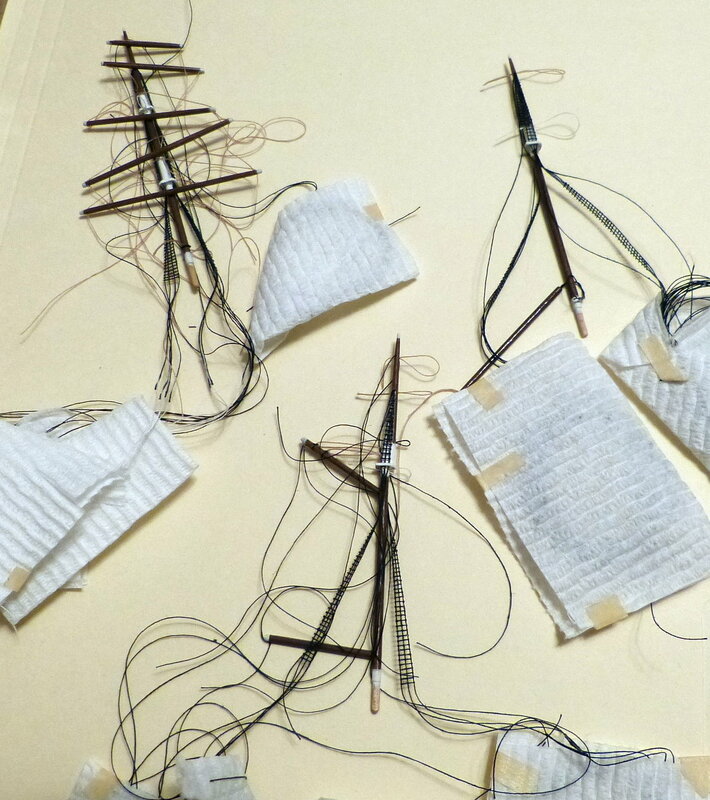 Here's a little write-up... because of the scale of these top shrouds, I’m making and attaching them in two sections. When completed, this particular one is 14 mm tall with three vertical threads meeting at the top and then flare to one mm between each at the bottom where they attach. 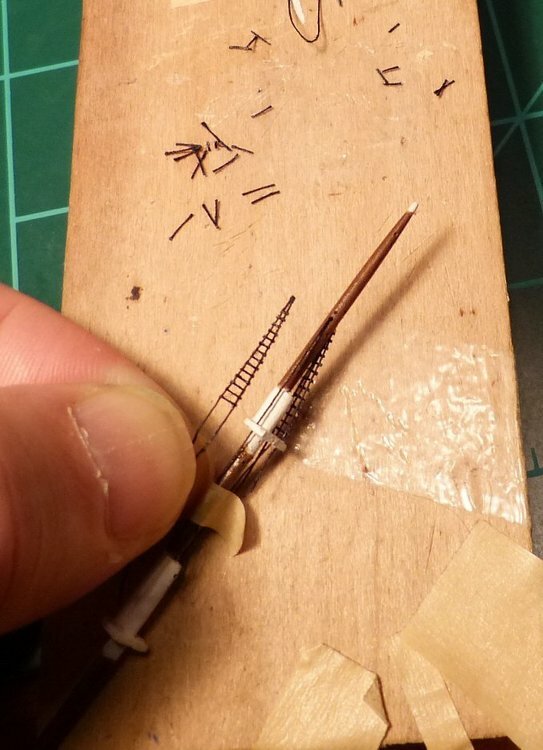 Assembly: the center thread is put in place on the mast first and held with tape to keep tension. The rest of the shroud is then glued to the lower part of the center thread. 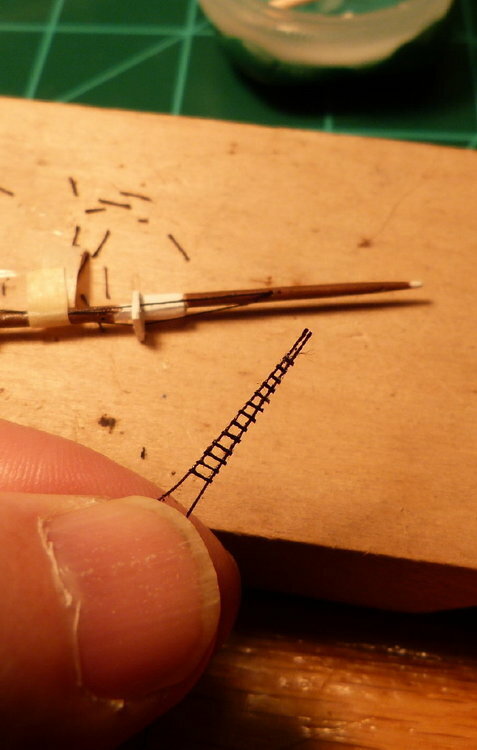 After any vertical adjustment, the threads are attached at the bottom then the top is trimmed and then attached. Lots o good tips here ! Tanks! That is a good approach. Great work. 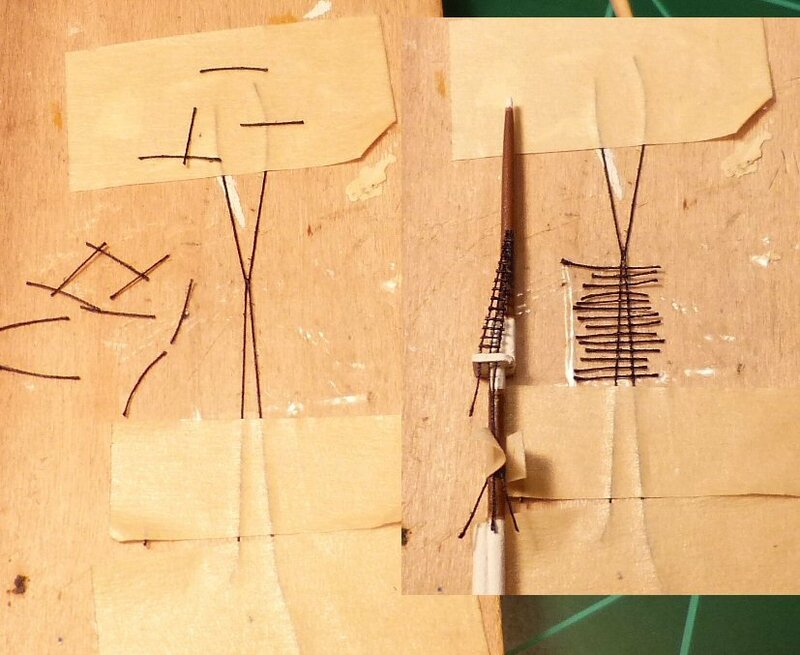 I form the shroud on top of clear tape, apply the glue with the tip of a pin, then flip it over for trimming. Hey, all. I’m making decisions on the foremast yard rigging. I’ve viewed photos of real ships for ideas and accuracy. 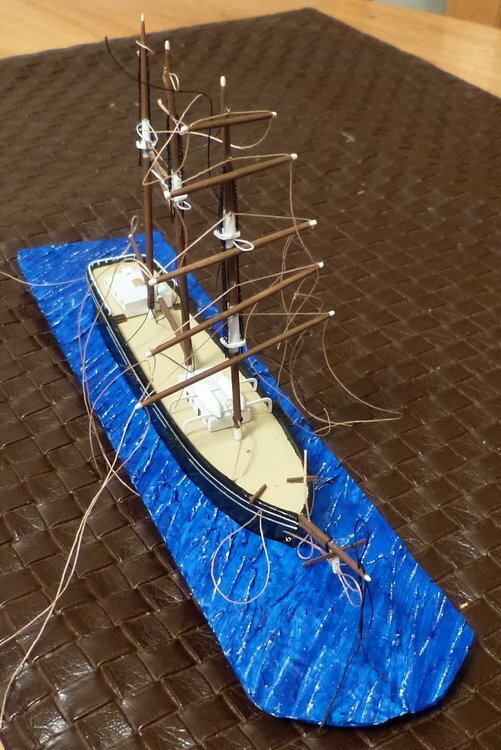 I want to place the yards in a “rest” position on the mast, lowered from a full sail orientation. 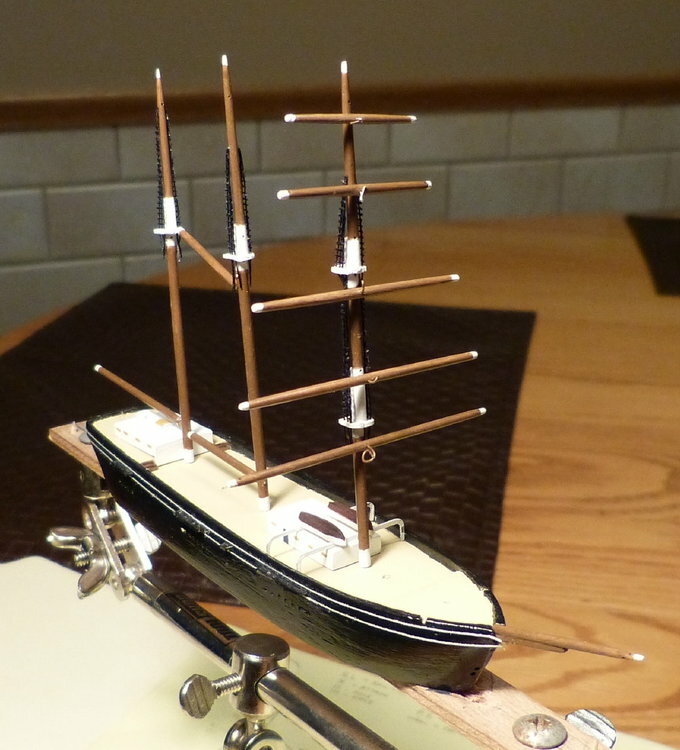 However, I think that all of the yards on my model will need lifts except one. After looking at a lot of photos of docked ships, it seems that some fore topsail yards don’t have lifts and therefore, they are immovable vertically on the mast. Am I correct about that? Any thoughts or suggestions on the lifts? I remember this coming up in a ship club meeting. Some of the more knowledgeable builders stated that the lifts weren't necessarily there to lift the yard arm up and down but were more for supporting the weight of the men as they went out on the yard arm to adjust the sails and rigging. The top most yard arms don't have lifts because they found it easier to bring that yard arm down to deck and work on it. They then would hoiat it back up into place. I'm going to see if I can find some sources to back that up but it does sound like you are correct t that the top most yards would not have had lifts. 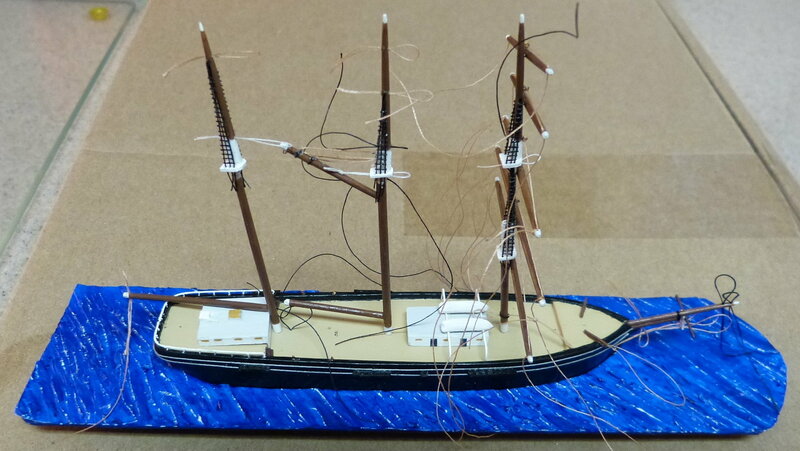 I appreciate your input, Mr. S.
For the sake of appearance and maybe sacrificing accuracy, every yard could have a line/thread attached to it that could be seen as its support, going from the yard end to the mast and then to the opposite end. A seaman may wonder, if my goal is to be accurate, why all the lifts? But a layman (yours, truly) would think I skipped a yard! At the risk of shroud sickness, here's a pic or two. It's getting closer to having them all on the masts. Trial run for the yards and booms. The yards are just under 2 mm diameter. I would say there's going to be quite a few rigging lines on this model. I'm always visualizing methods that would work for dealing with the threads/lines when it comes time to bottle her. 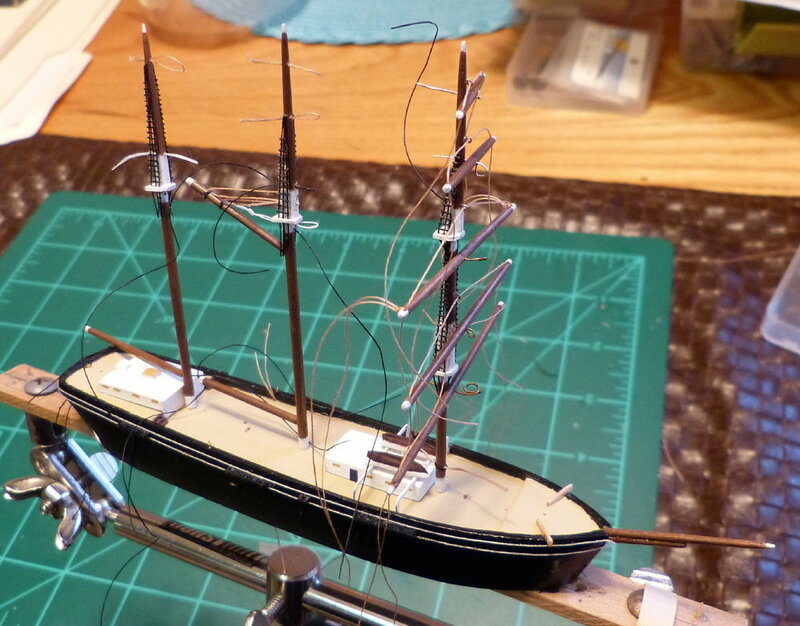 Especially because there are going to be lines from mast to mast and the masts are going in one at a time. I'm enjoying the process. I agree lifts on every yard will look aesthetically pleasing and you're right the landlubbers out there would probably question it. Or they won't notice the fine details at all which is more often the case. :/ All well. As far as the lifts go I found a good technique that works well. I use a thread block on the mast. If you aren't familiar with thread blocks they are a loop of thread created by tying thread around a needle and gluing the knot down. I'm sure there's a video in this forum somewhere. Any way. Tie the thread block to the mast where you want the lift lines to run to. Tie a lift line at the end of the yard and run it through the thread block and onto the end of the other side of the yard. 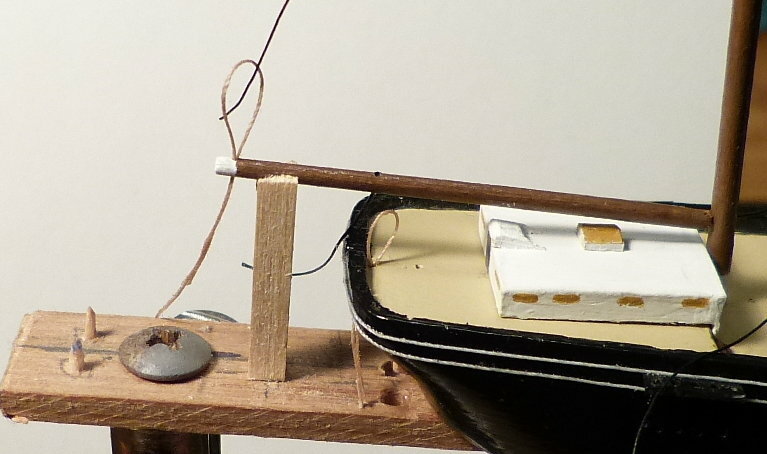 In this configuration the yard is able to turn sideways and be almost parallel to the mast since the thread runs through a block. The line will just be longer on one side than on the other. Once in tap the yard back into it's correct position. I would put a dab of glue on the thread block once the yard is positioned to keep it from moving. I like that idea about the thread block, Mr. S.! It comes at the right time for this project. It would be the most to scale attachment method and practically invisible. Tying it around the mast with maybe two close wraps would give it the appearance of being a steel band. Thank you for sharing that! I got a solid rigging plan for the work inside the bottle. 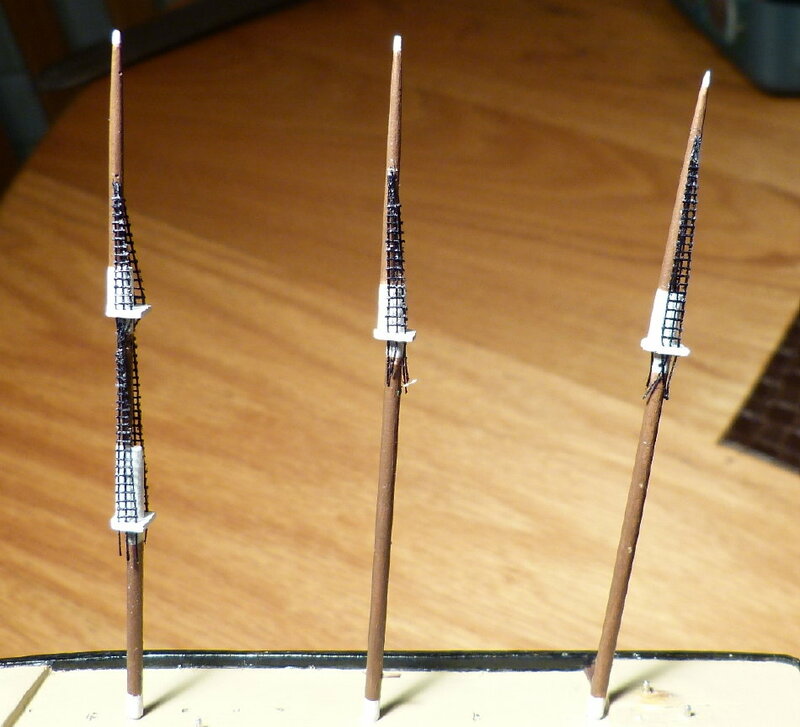 As I mentioned in my first post, the masts are pegged and going in one at a time. 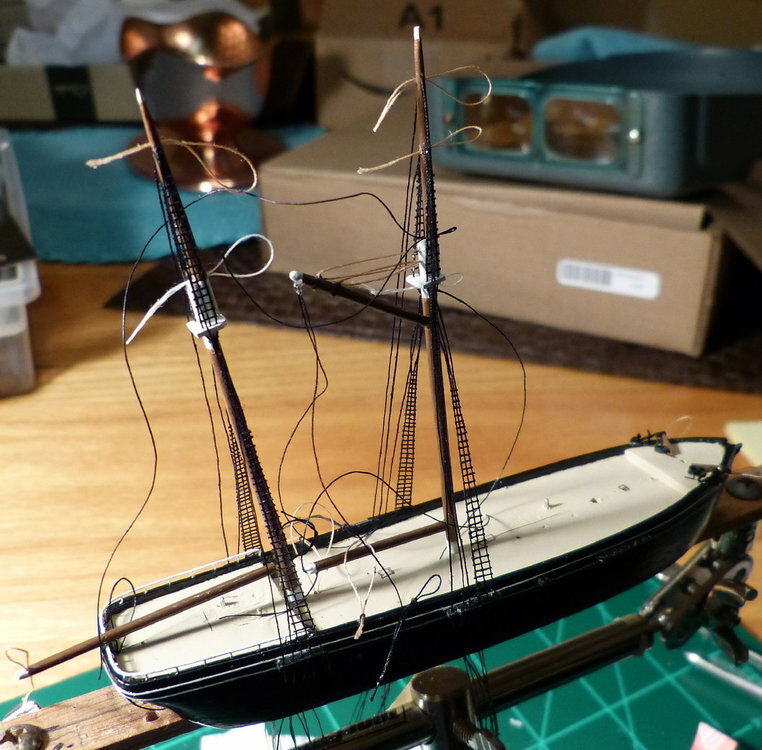 There're going to be lines threaded through the masts and the thread loops you see here are for that. This method will greatly reduce the number of topside lines going through the bottle neck. 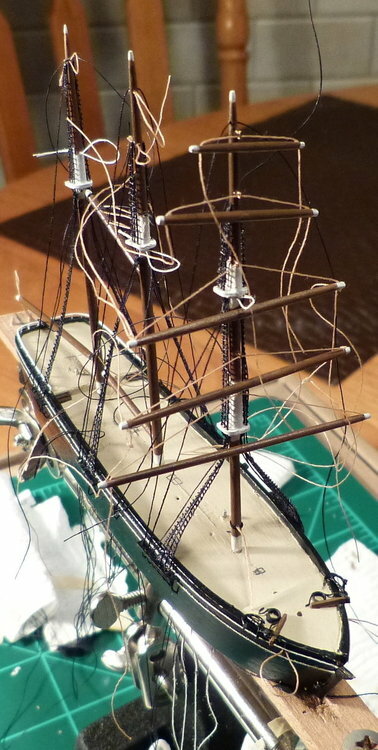 I realize that the masts will need steady support during all handling. Nicely done on the lifts. I agree anything that reduces the amount of lines coming out of the bottle really helps. I'm glad that worked out for you. Here is a support for the rear boom. In the bottle, it will hold the boom in the proper position while the adhesive at the mast dries and also brace the boom when the threading loop is used to pull the thread downward through the hole. 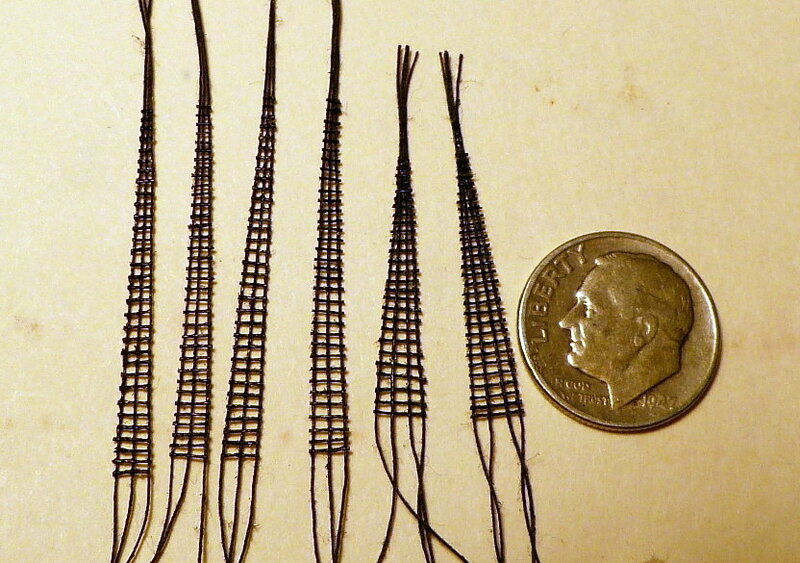 It is pegged with a very thin aluminum wire. For removal, the top of the post will be pushed aft. Painted the acrylic caulk sea then glued it to the thin wood sheet. (See it beforehand on the first page, about midway.) Scraped the high points to create whitecaps and touched up the troughs for the appearance of depth. Yes, it's blue but not as vibrant than shown here. In other words, I think it's realistic. I like how it turned out. I plan on putting her in the bottle this week. I made some thread handling tools that should make it go smoothly. Oh, yeah. Thank you, Charlie B. and everyone. I've added anchors and their ropes. The small hatch against the forward cabin is attached to it so that's all one unit. Nothing else is glued to the deck. 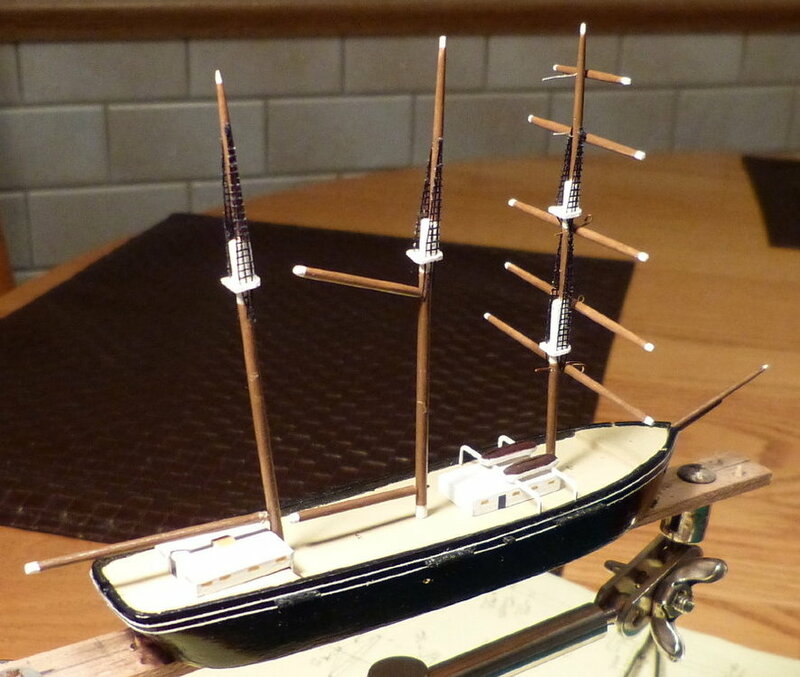 The masts have all of their lines attached and the extension threads for outside the bottle are tidied up. 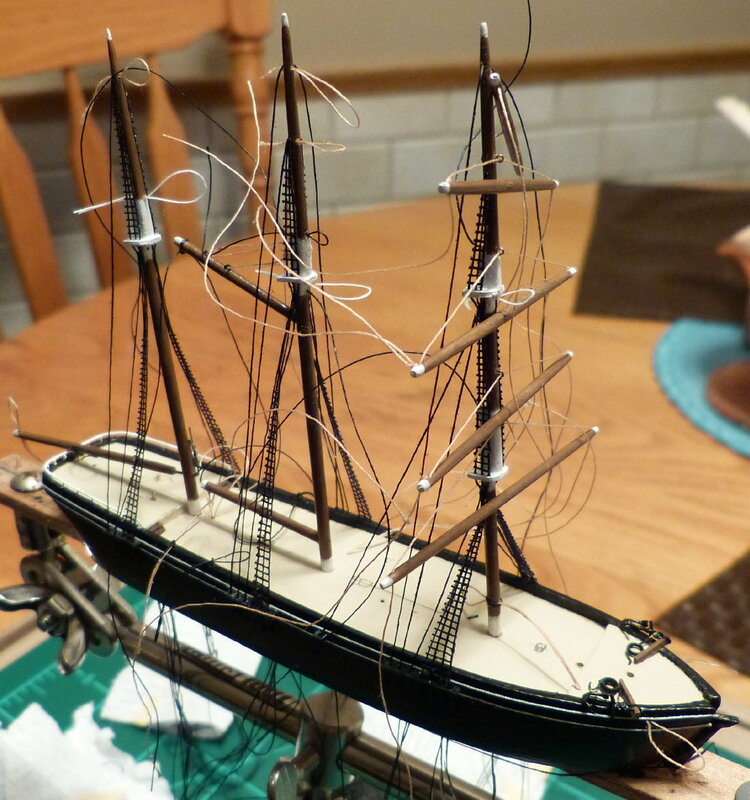 Began putting threads through the hull. 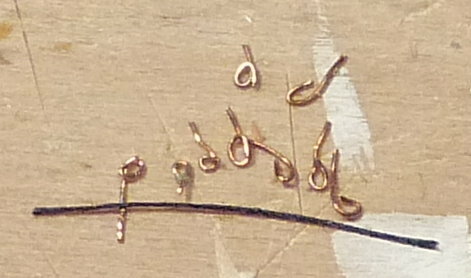 The photo seems to make the threads appear thin or small in scale. However, in hand, I believe it will end up having a good balance between everything. I think they look just right. The more that goes on the more these ships come alive. Thats one of the funnest parts. Not sure why I hadnt noticed the anchors before. They look great! The gaff hoist rigging was redone, like most things with this project. The pic shows what the result will be in the bottle, I hope. The hoist thread is attached only at the ends which makes the hoist equalize and results in tight bends and straight lines. The down-haul connection at the gaff end is a looped wire peg like one shown 4 posts above. And that wire peg is secured with a wire that goes through it and around the boom. I’m not trusting adhesive alone. The gaff boom is about 23 mm long. Well done. That looks great. The kind comments are much appreciated! 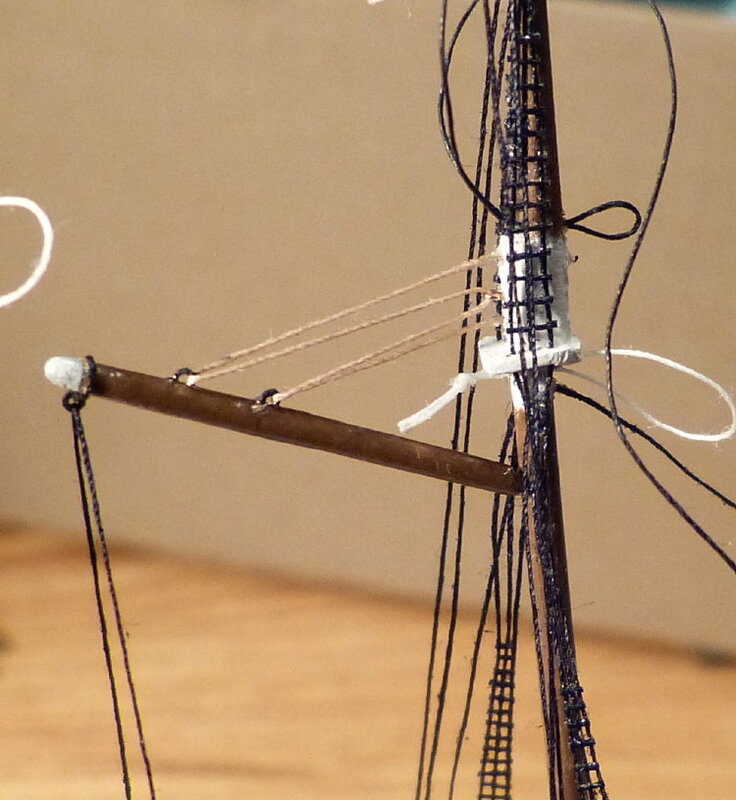 Now working on the foremast rigging that goes through the channels. Starboard side is done.